Prisms and wedges by IRD Glass are finished to exacting finishes and can be coated with anti-reflective, mirror, band-pass, and other thin film coatings. IRD Glass can fabricate virtually any type of prism -from a simple 90o right-angle prism to the most challenging variations and assemblies. Whether its rhomboid prisms, penta prisms, dove prisms, or roof prisms, each optical component will feature tolerances tighter than 3 arc-minutes and can be accompanied with NIST-traceable certificates accurate to within 5 arc-seconds for the optical angle/angle of deviation. The same applies to their light wedge and optical wedge offerings. 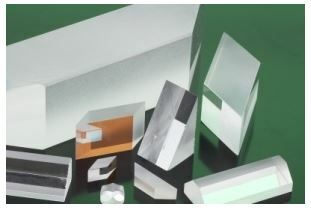 Contact IRD Glass to learn more about their prism and wedge offerings.